Winter Sprigs Spread Christmas Cheer! “Hello, Donald,” says the a mysterious W.T.G. “Hope Santa will be kind to you.” This beautiful card was sent to eight year old Donald C. Minor of Carmichaels, Pennyslvania from a relative or friend in Uniontown, Fayette County, Pennsylvania on December 22, 1910. 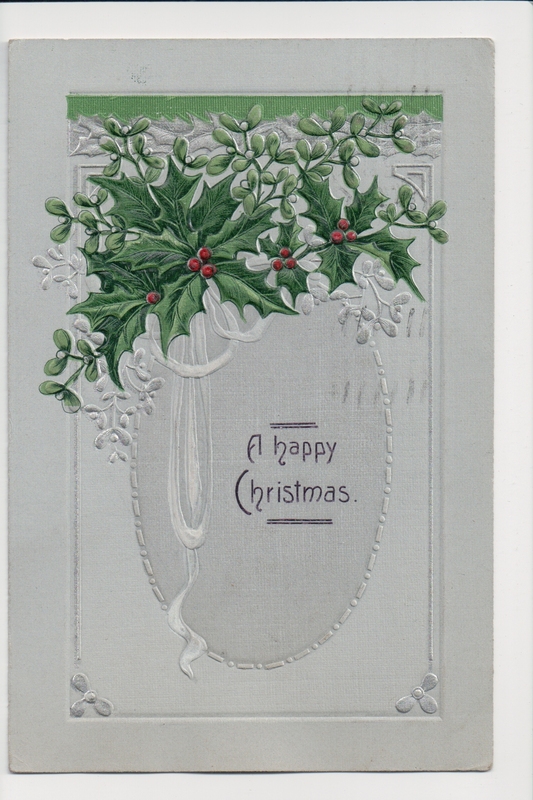 It’s a very simple card, with a silver background highlighting the embossed sprigs of holly and mistletoe, Victorian symbols of domestic happiness and affection. Wishing everyone a simple, happy Christmas holiday! Previous Article My Fair Lady Wishes You A Happy Christmas! Next Article May Good Luck and Christmas Greetings Fall Upon You!